Facebook has released a new feature called 'Watch Party'. 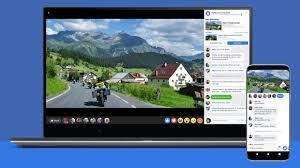 This enables users to watch videos and comment together in real time in a group of social networks. After nearly six months of testing, Facebook launched this feature on Wednesday. Through this, Facebook wants to compete with YouTube in the streaming space. Facebook's product manager Erin Connolly said in a statement: "Once the Watch Party is started, the participants can watch live or recorded videos, and can also interact with each other." To use this new feature, any Facebook group members have to search for a video on the forum and invite others to join them. After that, a chat window will open and the members can discuss each other while the video is playing. On the global launch of this facility, Facebook also included two new features which were not available in the testing phase. It includes a co-hosting feature, which allows the host of 'Watch Party' to nominate other co-hosts who can add videos and continue the party. Facebook has added an Outsourcing feature in it, which enables the members of the group to suggest the video to add the host to the 'watch party'. Facebook also disclosed that 'Watch Party' will not be limited to Facebook groups alone. This feature is also planning to release for company pages, which usually gives information about public figures and other organizations' profiles.